“Asakusa” Shrine is right next to the famous “Kaminarimon (Gate of Thunder). It is also known as “Sanja Gongen” or “Sanja-sama”. Let’s check the history and attractions of Asakusa Shrine. Why is it called “Sanja Gongen” or “Sanja-sama”? What kind of benefit does it confer? When was it founded? Asakusa Shrine was founded in 628 when a Buddha statue was found in the River “Sumida”. It was fisherman brothers who found the Buddha statue and they are enshrined at Asakusa Shrine. The intellectual, Hajino Nakatomo who recognized the statue as “Kannon Bosatsu” (Kannnon Bodhisattva) when the Buddha statue was found, is also enshrined at Asakusa Shrine together with two fishermen. 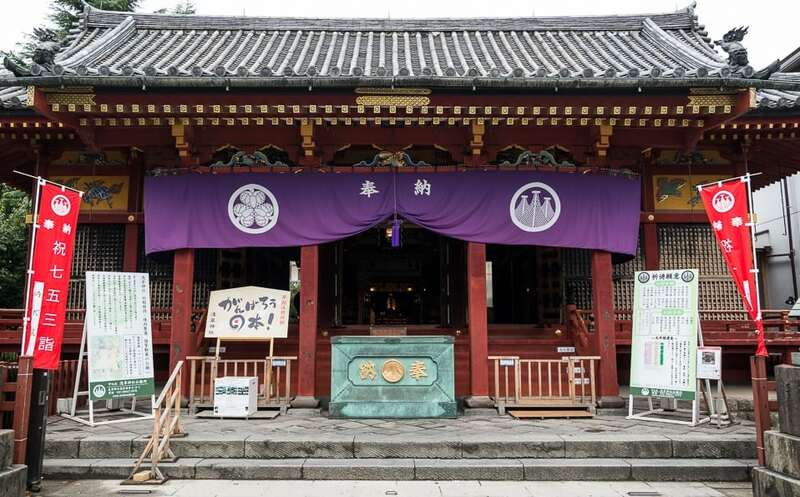 In this way, Asakusa Shrine has a history that three people are enshrined and it been named “Sanja” (three shrines). So that people call it “Sanja”. Further, in the Meiji Era, Ieyasu Tokugawa and “Ookuninushi-no-Mikoto” ( a Shinto deity) were newly enshrined. Until then the shrine used to be called “Sanja” (three shrines) because three persons were enshrined, but it was renamed officially as “Asakusa” Shrine and it is so to the present. Asakusa Shrine grants you happiness of the family, safe driving, prosperous business, prevention from diseases, good health, success in examinations, etc. Asakusa Shrine is known to be for “Shingan Joju” (All your earnest wished will be fulfilled). 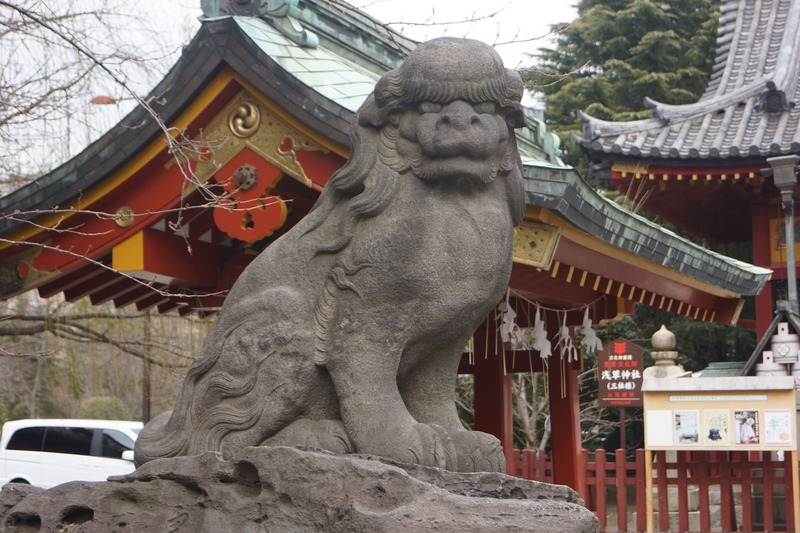 In front of Asakusa Shrine there is a gallant guardian dog which protects the shrine from the evil. He has bangs, oval eyes as well as curly beads and a moderate pug nose which are typical features of Edo guardian dogs. Why not meet a gallant but quiet guardian dog. The main building of Asakusa Shrine is called “Gongen-zukuri”, one of architectural styles of shrine building. 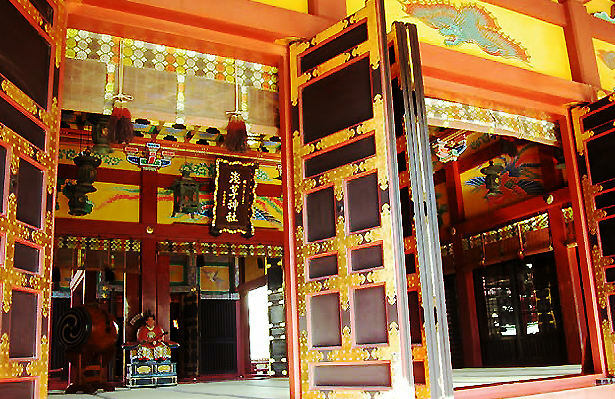 It started in “Kitano” Shrine in the Heian Period and has been widely used in modern shrine buildings since Toshogu Shrine adopted it. It is also called “Ishinoma-zukuri” or “Yatsumune-zukuri”. 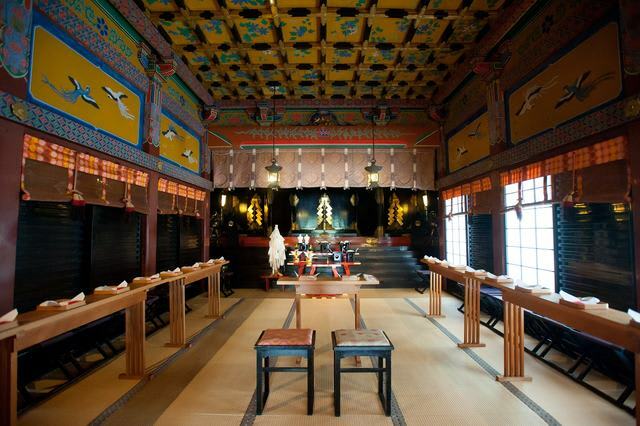 The current main building of Asakusa Shrine was donated by Iemitsu Tokugawa, the 3rd Shogun. Even today after 350 years, it still preserves the original figure of that period. 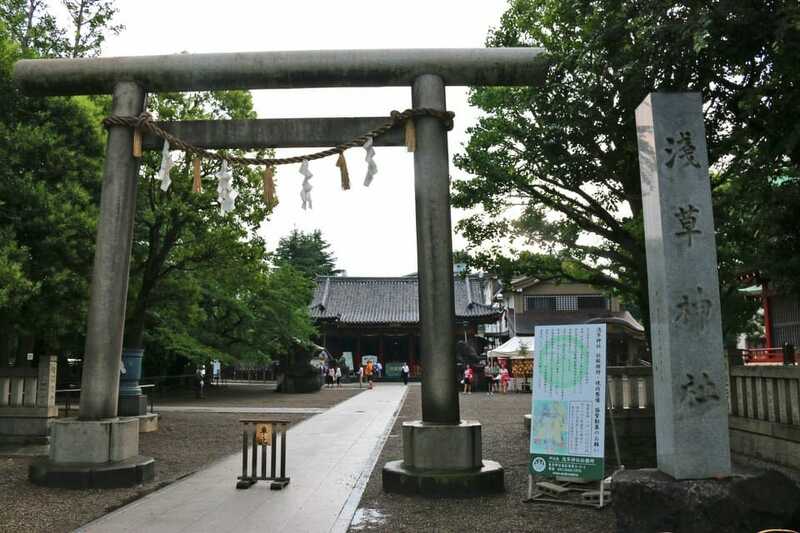 Passing “Torii” (a shrine gate) you will find “Meoto Komainu” (a pair of guardian dogs) near “Kaguraden” (Shinto dance hall). They are rather small. 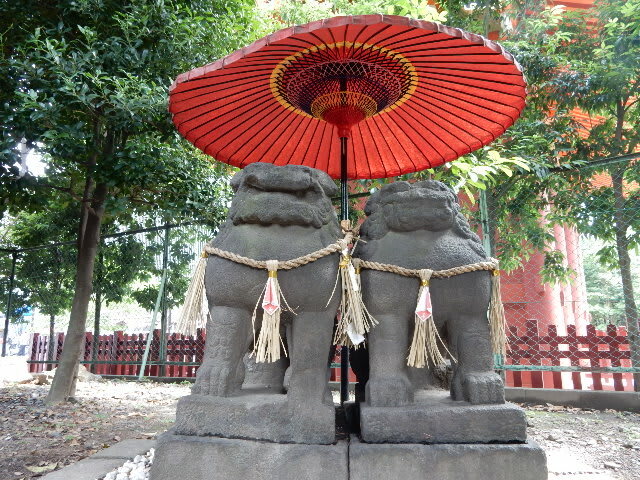 Usually guardian dogs are placed face to face, but “Meoto Komainu” are placed closely side by side. Since they are cuddling close to each other, people believe that “Meoto Komainu” brings you a good marriage, fulfillments in love and harmony between married couples. A lot of sacred beasts are painted in the shrine. Most of them are fictitious animals and they are symbols wishing peace and people’s happiness. The sacred beasts are from Chinese ancient myth such as “Hooh” (a Chinese phoenix), “Kirin” (a Chinese unicorn), “Hiryuu”(a wyvern). Let’s find them in the shrine. ・Hours: Free visit in the shrine Office: 9:00a.m. – 4:30p.m.